Since ebooks are steadily replacing paper books, having a decent ebook reader appears to be an essential necessity. There are a good news and a bad news: the good news is you can download any book for free without even leaving your home. The bad news is you can’t open these books unless you have a special ebook reading device or software. 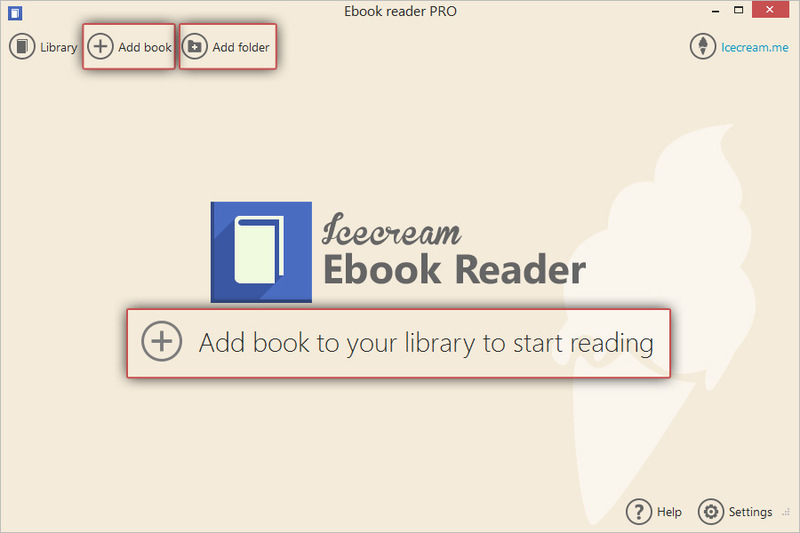 Icecream Ebook Reader will help you read ebooks on PC and thus save some book shopping time and a lot of money. Check this article to understand how this application works. If the program isn’t installed on your PC yet, download Icecream Ebook Reader from our website: save the installation file, run it and proceed with the installation as suggested by the Wizard. When the program is installed, open it and start working. Click the “Add book to your library to start reading” button under the program’s logo or "Add book" button in the upper left hand side corner of this ebook reader's window. Windows Explorer will be opened, and you can browse your hard drive to find previously downloaded books. To add a folder with a whole bunch of ebooks in it, press the “Add folder” button (it can be found to the right of the “Add book” one). Drag and drop mechanism can help you to add both the books of the formats supported by the program (ePub, MOBI, FB2, PDF, CBZ and CBR) and the folders with the files. You can access all the added books by clicking the “Library” button in the upper left corner of the main window of Icecream Ebook Reader. All the books that are located in the Library can be displayed in a form of a chart or a book shelf – click the icon in the upper left corner of a working area to select a desired view (Table view or Bookshelf). The chart (Table view) contains a book’s title, author, reading progress, date when the book was added to the Library, the information about the number of the added notes and the instruments to add the book to Favorites and delete it from the Library. The Bookshelf view shows the covers of the books as a grid. Menu that can be found at the left side of the window of the program lets you to check your recently read books (Recently Read) or all books (All), and also check the books that were added to favorites (Favorites): you can mark a book as favorite by clicking on a little star icon on the right of the book. Press the “Formats” button to open the list with the available formats (EPUB, FB2, MOBI, PDF, CBZ, CBR) of the books that are in the Library. In the lower part of the menu there's an “Add new category” button. This option of the program creates custom categories to sort the books in. These categories can be renamed or deleted upon demand. The “Deleted” section of the Library contains the books that were previously deleted from the Library. There you can find the options to restore the books back to the Library, restore the individual books, delete all the books from here at once or delete books one by one. Click the “Settings” button in the bottom right corner of the main window. It will bring you to the Settings panel where you can configure the settings of Icecream Ebook Reader for the most comfortable ebooks reading. The full guide for the settings of the program can be found over here. 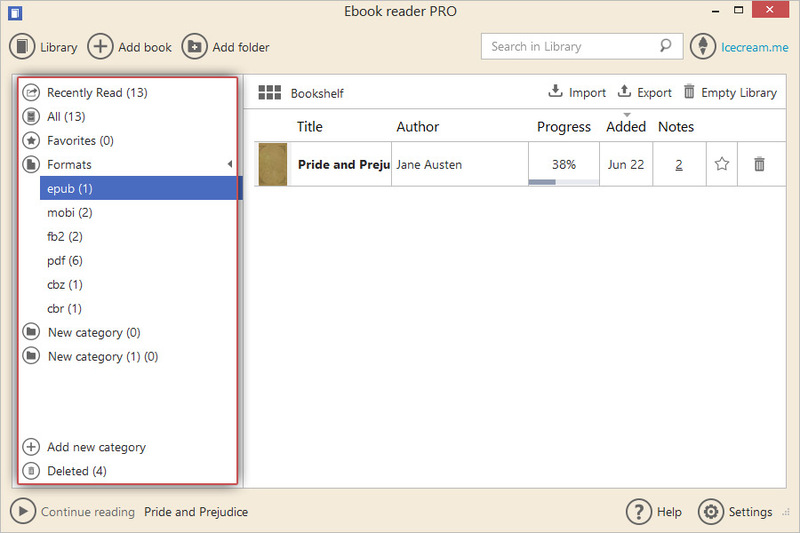 To read ebooks on PC, just double click the book’s thumbnail when in Bookshelf view or the book's title when in Table view mode of the Library. If your digital library is too large and you can’t find your book in the list, type the title in the search box in the upper right corner of the program's window and click the magnifier icon to proceed with the search within the Library. As soon as the book is opened, the text will be displayed in the window – now, you can start reading the book. Click at the sides of the window or press “Left”/“Right” or “Space”/”Backspace” keys on your keyboard to turn the pages of the book. 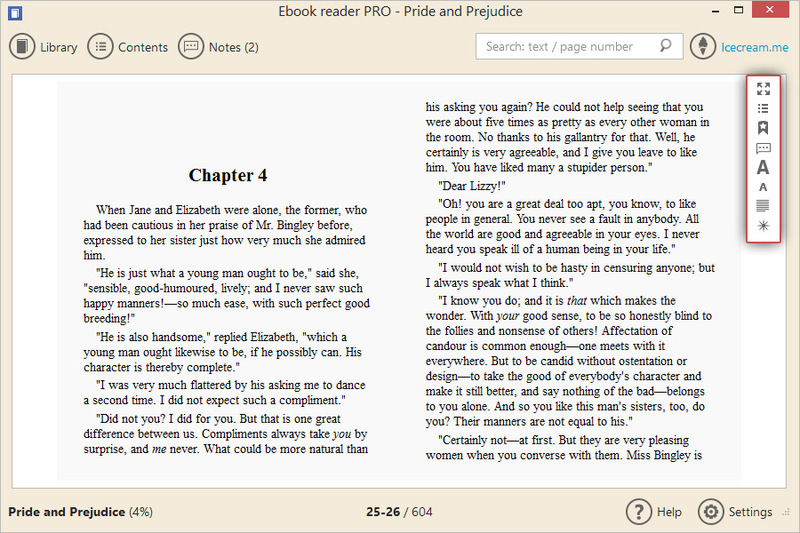 Switch the profiles of the ebook reader (Day, Night or Sepia).